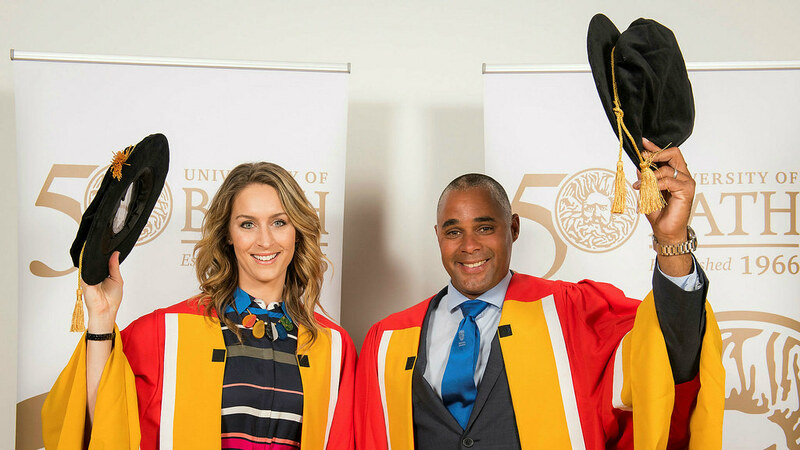 Olympic Gold medallists Amy Williams MBE and Jason Gardener MBE were today, Friday 23 June, awarded honorary degrees from the University of Bath. Bath’s ‘Golden Girl’ Amy Williams who won Gold in the women’s Skeleton event at the 2010 Vancouver Winter Olympic Games, has been honoured in recognition of her distinguished sporting career as a skeleton racer. The ‘Bath Bullet’ Jason Gardener is an Olympic Gold Medallist, World and European Indoor Champion and has been honoured in recognition of his distinguished sporting career. In winning gold, Amy became the first British athlete to win a solo Winter Olympic Gold medal in 30 years and the first by a woman for 58 years. Amy started training at Bath in 2002 making use of the newly-installed push start track at the Sports Training Village and completed a Foundation Degree in Sports Performance from the University of Bath in 2007. Following winning Gold in Vancouver, Amy was awarded an MBE in the 2010 Queen’s Birthday Honours and became the first-ever female Honorary Freeman of the City of Bath. Since retiring, she has enjoyed a number of successful careers including presenting on numerous TV shows, and hosting, presenting and speaking to many companies, businesses & schools. Most recently, Amy gave birth to her baby boy Oscar Nash and lives happily married in Bath with husband Craig Ham. Jason won Gold in the 2004 Athens Olympics 4x100m relay and is the 2004 Budapest 60m World Indoor Champion and four time 60m European Indoor Gold Medallist (2000, 2002, 2005, 2007). Jason is also a member of the exclusive sub-10 second club for 100m having clocked a personal best of 9.98 seconds. He began training at the University in 2002 under the tutelage of Malcolm Arnold OBE, one of the most successful athletics coaches in the world. In 2014, Jason was made an Honorary Freeman of the City of Bath and was inducted into the University of Bath’s Hall of Fame for Sport, and was awarded an MBE for services to athletics in 2005. Jason retired in 2007 and is currently President of UK Athletics. He also runs his own marketing consultancy agency, specialising in the Olympic and mainstream sports market, working with some of the world’s most renowned brands. He is also a highly successful motivational speaker delivering engaging and inspiring speeches to a range of businesses and organisations.